the Hindu Holy day Kamada Ekadashi , I know you have many questions about this festival or holyday. Need not to worry guys , I will give you all information about this holy day. So sit relaxed and read full article. 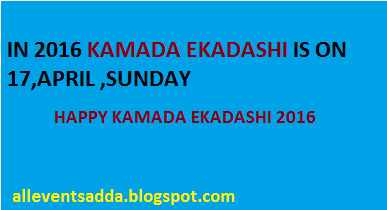 Why we do celebrate Kamada Ekadashi? 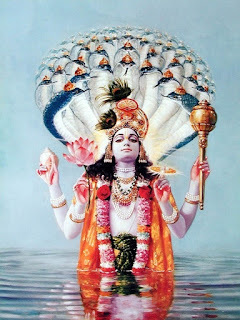 Actually, Kamada Ekadashi is celebrate in honor of Lord Vishnu, it is believed that observing Kamada Ekadashi vrat will help in concentration, regaining and increasing virtue, this day also believed as blessing day for those couples who don't have child's and trying to have a child for long years. It is also believed that Lord Vishnu grant all desires of devotees on this day.These all are the reasons behind celebrating Kamada Ekadashi. When Kamada Ekadashi falls every year according to Lunar Calendar? According to Lunar Calendar ,Kamada Ekadashi falls on 11th day in month of Chaitra (hindu month) or in the month of Chaitra , 11th day in shukla paksh is known as Kamada Ekadashi. What devotees use to do on Kamada Ekadashi? Devotees observe fast , they offer prayers to Lord Vishnu, and all. What devotees do for fast on Kamada Ekadashi? They just take one time meal on this day, meal may include all the pure milk products, fruits ,vegetables and all except salty products. The legend about Kamada Ekadashi is narrated by the god Krishna to the Pandava King Yudhishthira in the Varaha Purana, as it was told by the sage Vasishtha to King Dilipa. Once, a young gandharva couple, Lalit and his wife Lalita, lived in the city of Ratnapura, a highly prosperous city decorated with gold and silver, which was ruled by the King Pundarika. Lalit was a famed singer, while Lalita was a renowned dancer at the royal court. One day when Lalit was singing in the royal court, his attention fluttered from the song to his wife, who was absent from the court. As a result, he missed some beats and incorrectly ended his performance. A serpent in the court complained to the king of the folly and said that Lalit considered his wife more important than his master, the king. Infuriated, the King Pundarika cursed Lalit to become a monstrous cannibal, who was sixty-four miles in height. His neck was like a mountain, arms eight miles long and mouth the size of huge cave. This greatly distressed Lalita who wandered around the forests with her monstrous husband who dealt in sinful activities. While wandering around the Vindhyachal Hills, Lalita came across the sage Shringi. Paying her respects to the sage, she appealed to him to provide a solution to her problem. Sage Shringi told her to observe the vrata (vow) of Kamada Ekadasi, to atone for the sins of her husband. Lalita observed the ekadashi fast with great devotion and the next day again visited the sage and bowed to the god Krishna. She requested God to free her husband from the king's curse as a reward of the religious merit gained by the fast. With the blessings of Krishna, Lalit was restored to his original gandharva form. Thereafter, they were taken to heaven on a celestial flying chariot. Thanks for reading guys, I wish ,Lord Vishnu grant your desires and will inspire you daily to do something new. The legend about Kamada Ekadashi was explained by Lord Krishna to the Pandava King Yudhishtira and is mentioned in the Varaha Purana . The legend is about a Gandharva couple named Lalit and Lalitha. They were extremely good dancers and singers. And they used to perform in the court of King of Ratnapur, Pundarika. Once, Lalit was asked to do a solo performance. But he loved his wife so much that he could not bear such separation. Hence, he made frequent mistakes in his performance. One of the serpents informed King about this. Infuriated, the king cursed Lalit to become an ugly looking demon. King thought that Lalita would leave her husband but she told him that she will never leave him in any conditions. While wandering the forests, couple passed across an ashram of Sage Shringi. They requested him to find a solution to their problem. Sage asked them to observe the great Kamada ekadashi fast. Couple observed the fast with complete devotion and Lord Krishna freed Lalit from the curse of the king. As a merit of this fast, Lalit attained his original gandharava form and the couple was taken on a celestial flying chariot in the end. Hello ,Thanks for visiting, hope you come back. Jason Morrow के थीम चित्र. Blogger द्वारा संचालित.